What is the EBVM ? "The First 24-hour Veterinary Emergency"
We are open and fully staffed for emergencies 24 hours a day, 365 days a year. and your pets are never left alone. 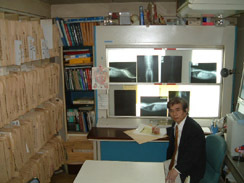 We were the first veterinary hospital with 24 hour emergency care service in Japan. 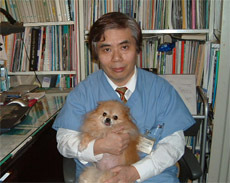 Mitaka Veterinary Medical Group is a full service,24 hour emergency service animal hospital serving Musashino City in the suburbs of the Tokyo region. We treat a wide variety of companion animals, including dogs, cats, caged birds, wild birds, raccoons, iguanas, rabbits, tortoises, monkeys, skunks, gerbils, chinchillas, hamsters, hedgehogs, panda mice, ferrets, prairie dogs, guinea pigs, squirrels, etc. We will provide urgent care for any animal presented 24 hours a day, 7 days a week. We're proud to be celebrating more than 27 years of providing loving and quality care for your pets of all kinds! Our goal is to provide superior veterinary care and veterinary medicine with friendly and compassionate care. Please call for an appointment if you can.